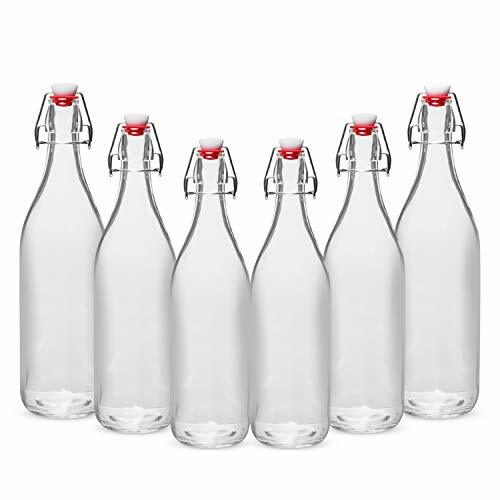 Whether you are looking to brew your favourite kombucha or kefir, or you want to store freshly pressed juices to preserve vital enzymes and nutrients or you looking to store infused oils, vinegar or even water, these Flip Top Bottles are just what you need. Available in a set of 6 each 33.75 Oz, you can now store all your oils, liquids or beverages. Leave nothing behind. Our brewing bottles are also BPA, toxin, chemical and lead-free. With no risk of contamination, you can now buy and use with confidence. Put the worry aside. With each bottle fitted with a plastic and rubber stopper, annoying spills and leaks will be a thing of the past for you. Made for that airtight seal on your Giara Glass Bottle, you can now maintain that fresh, delicious taste on your favourite beverages. Our airtight design will prevent fermentation, carbonation or oxidation of your beverages and freshly pressed juices. What’s more, our easy to remove and put on cap design offers quick access to your bottles. A heavy duty, sturdy construction will resist impacts and adverse temperature changes. Elegantly designed to look great on top of your cabinet and enhance your kitchen décor. Our glass bottles are made for ultimate durability. A great housewarming gift idea. Super-easy to clean and use. Stop Stalling! Click ‘add to cart’ now Grab yourself our One of a Kind Giara Glass Bottles Today! SECURE, LEAKPROOF CAP: Each Giara Glass Bottle comes with a handy plastic and silicone stopper that will tightly seal your bottle. Our airtight gaskets ensure your beverages won't ferment or get carbonated. Caps are easy to remove or put on. ENJOY RISK-FREE USE: All our swing top bottles are BPA, toxin, chemical and lead-free. You can now store your oils, beverages or water without worry over contamination. Available in a set of 6, we've ensured you will have enough bottles for use. If you have any questions about this product by WILLDAN, contact us by completing and submitting the form below. If you are looking for a specif part number, please include it with your message.